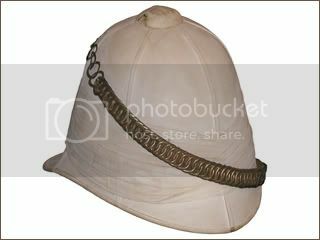 Authorized in June of 1877 the regulation Foreign Service Helmet, was made of cork and covered in white cloth with six seams. 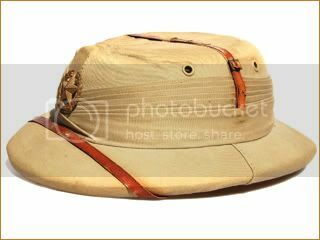 It was worn throughout the empire, and this pattern remained in use until replaced by the Wolsely pattern helmet. Despite what movies suggest the helmet was typically worn without a badge. 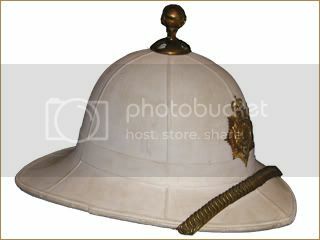 Officer's helmets typically utilized the same type of chinscales as the Home Service Helmet. 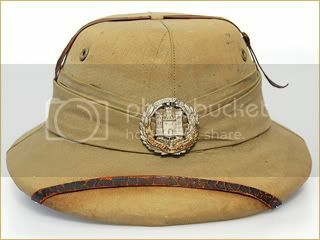 This example is covered in doeskin, which was a common covering for private purchase officer's helmets. 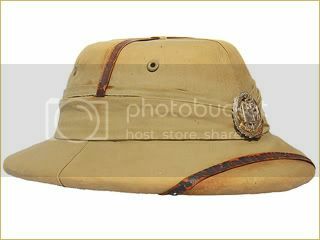 This excellent example of the British Foreign Service helmet dates to the Boer War. It features the flash of the Royal Artillery, and was originally owned by a Captain O'Malley. This helmet came from a good friend's extremely prestigous collection in the U.K. 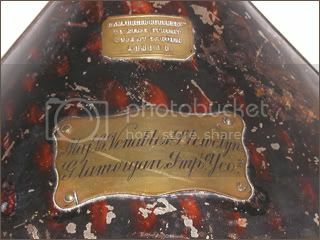 This example was formerly owned by Major C. Venables-Llewelyn of the Glamorgan Imperial Yeomanry. This example is complete with its correct original white metal chin chain. It was produced by Hamburger Rogers & Son King Street, Covent Garden, London. 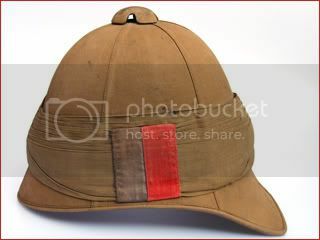 It features the puggaree, which was authorized for wear on the helmets in 1877. 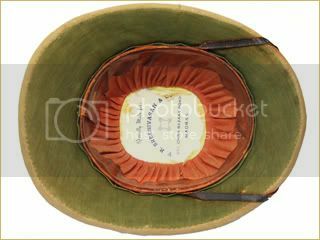 This cloth wrap around the outer headband of the helmet, for station in Malta, India, Ceylon, Hong Kong, the Straits Settlements, the West Indies and Bermuda, St. Helena, Canada, West Africa and the Cape. 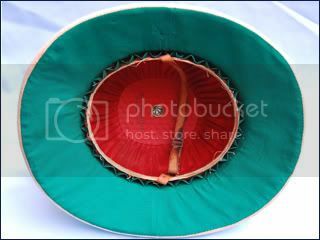 The purpose of this cotton cloth wrapping was to help keep the helmet cool. 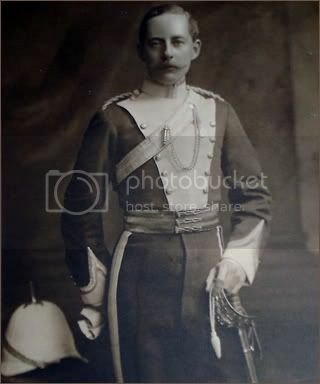 This undated photo shows Sir Charles Venables-Llewelyn with the helmet. (Photo courtesy of Sir John Venables-Llewelyn). 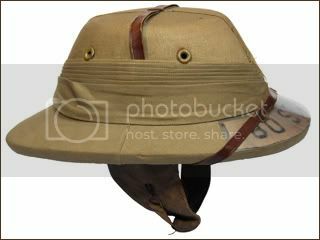 Commonly called the topi, the Wolseley sun helmet was used throughout the late 19th century, and remained in service through the Second World War. 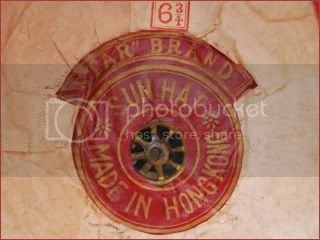 The body is cork covered with khaki drill cloth, with six seams. 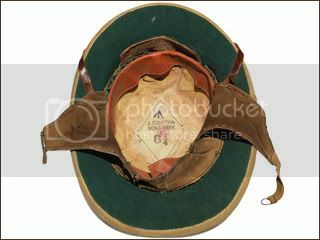 These helmets were typically bound around the headband with a khaki pugree. 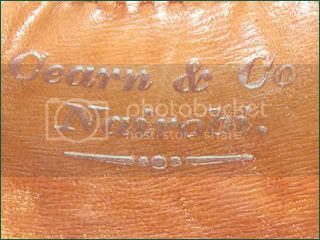 This helmet example features the retail label of Cearn & Company in Nairobi. 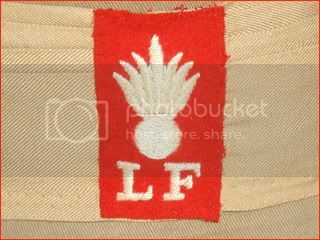 This helmet example is from the interwar period, and features the Regimental flash of the Lancashire Fusiliers. 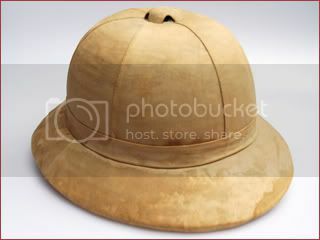 While this helmet is from after the First World War, the unit fought at the infamous Gallipoli campaign in 1915 and wore helmets very similar to this one. 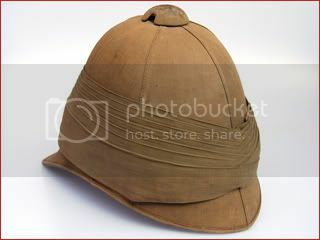 This helmet example is from the interwar period. It features the naval blue and white pugree. 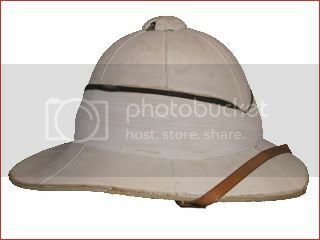 This helmet is a later example of the Wolseley helmet pattern. It features only four panels and lacks the puggaree wrappings, both likely indicating a wartime economy measure. 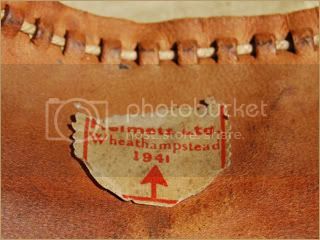 This example is dated 1941, and has a maker label that says "Helmets Ltd., Wheathampstead." 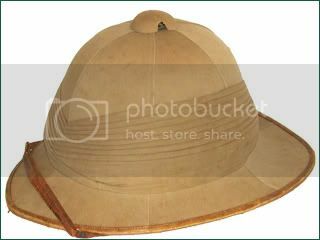 A World War I era sun helmet based on the Indian patterns. 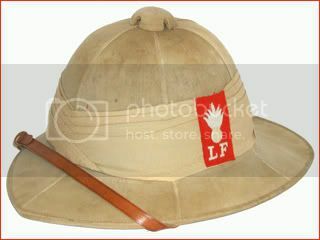 This helmet was made locally in the West Indies and features the puggaree of the West Indies Regiment. 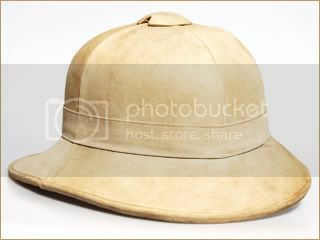 The British "Cawnpore," also known as the "India Pattern" or "Aden Pattern" sun helmet. 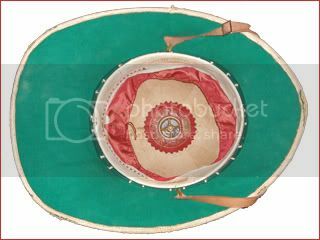 This topi replaced the traditional Wolseley pattern during the First World War, and was used throughout the British Empire. This pattern remained in use throughout the 1920s and 1930s, and even some use during the Second World War. 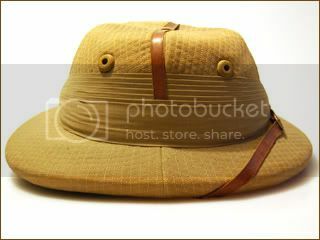 The India Pattern Sun Helmet, more commonly known as the "Bombay Bowler." 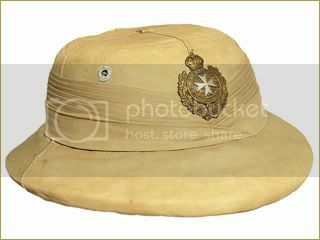 This type of helmet was highly popular with British regiments during the Second World War in India and Burma, while also being popular with officers in North Africa. 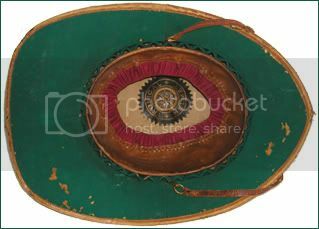 This example was made in India, and features a front badge of the Northamptonshire Regiment. 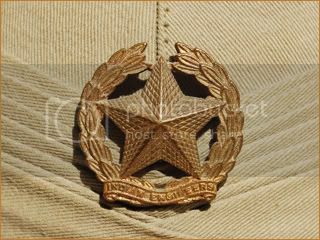 These badges were not typically worn in the field, but were common behind the lines by many soldiers. A 1930's era "Bombay Bowler." 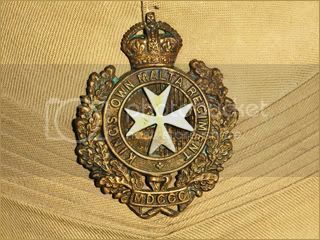 This example was made in India, and features a front badge of the King's Own Malta Regiment, which was a territorial infantry regiment prior to Malta's independence. The unit was disbanded in 1921, but raised again in 1931. This helmet comes from the collection of Dave Powers. A wartime-made "Bombay Bowler." 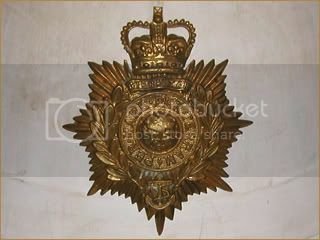 This example was made in India, and features a front badge of the Indian Artillery, indicting that it was possibly used during the transition from the British Indian Army to the post-1948 independent Indian Army. 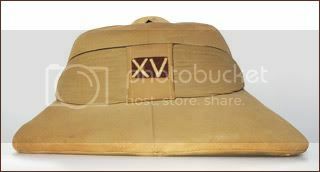 The Khaki Sola Pith helmet replaced the Wolseley in 1938 in India. This example has the flash of the East Yorkshire Regiment. 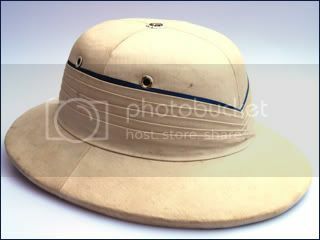 A mid-1930s "Bombay Bowler," Tropical Flying Helmet Type A, of the style used by the Royal Air Force in the Middle East. 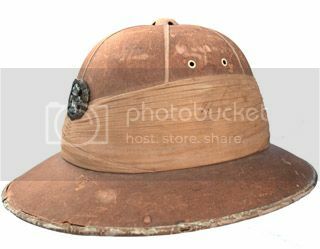 This is a cork helmet with a leather liner based on a standard flying helmet. The sweatband intacts this was made by "J Compton Son & Webb," and the front has a celluloid cover attached to the peak with a removable label. This is marked "80th Squadron," which was equipped with Gauntlets and Gladiator aircraft. The unit was sent to Egypt in 1938 and served there to protect the Suez Canal. 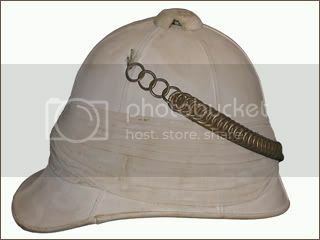 This style helmet was also used throughout the Middle East, including during operations against Iraq in 1941. A late pattern "Bombay Bowler." These were still used in India in the years after World War II and prior to the nation's independence. 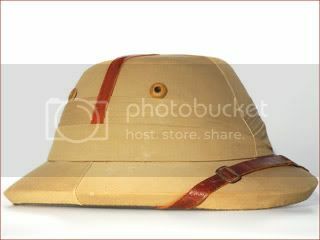 A pre-World War II era sun helmet based on the Cawnpore pattern. 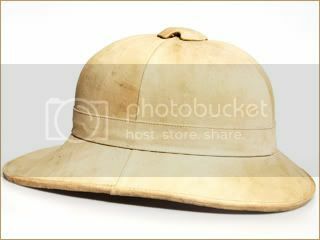 This sola pith helmet was made locally in Hong Kong. 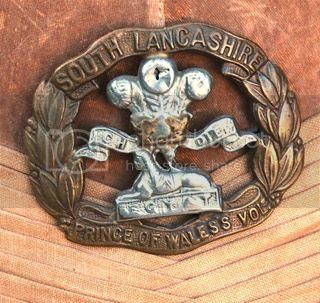 An inter-war era "Standard Pattern" helmet featuring the badge of the South Lancashire "Prices of Wales's Volunteers." 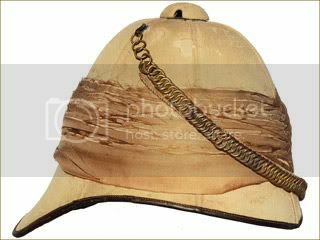 The Wolseley pattern helmet has been the standard dress headgear for the Royal Marines, featuring a ball on top, a distinction once standard for artillerymen. This derives from the part of the Corps that was once the Royal Marine Artillery. This example is dated 1973.